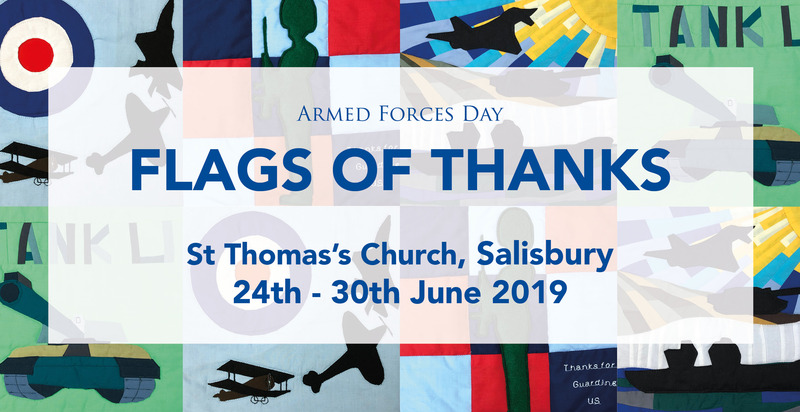 ‘Flags of Thanks’ is a national collaborative art project led by Alabaré, as part of the 2019 Armed Forces Day celebrations hosted by Salisbury. The nation will be asked to create customised flags that reflect the gratitude and support for the Armed Forces Community, from those currently serving, to veterans and cadets They will then be displayed in a public exhibition during the event in June, at St Thomas’s church in Salisbury city centre. Afterwards, the general public will be able to sponsor having a flag made into something meaningful or useful, such as a sleeping bag or quilt. These will be gifted to residents of Alabare’s Homes for Veterans, who have previously been homeless, as a gesture of support and community. Lt. Col. Neil Stace, also known as the Sewing Soldier, will be spearheading the project, running workshops and transforming the flags into quilts, sleeping bags and ponchos. Anyone can make a flag from the experienced quilter and sewer to the creative novice who can use a pair of scissors and glue. The fabric flags can be either patchwork, appliqued, embroidered, drawn or painted with washable fabric ink or any combination of the above. Designs are to be military themed or literal messages of thankfulness. It would be really lovely if you included a note as to who they were from and where, and any message you would like to share. To ensure that we are able to include as many flags as possible, please make sure your flag has arrived by the 10th June 2019.